Barnes Lakes is not your average fishery. Let's be straight - if you are happy ripping leaded Cat�s Whiskers and Vivas past recently stocked rainbows then read no further; go elsewhere, it's unlikely that you'll be happy here. On the other hand, if you like to use imitations of insects to fool wise rainbows and browns in clear waters set in beautiful and well-kept countryside, then please read on. This is above all a traditional, sporting fishery. And as if to add to the attraction, catch & release isn�t just allowed here, it is actively encouraged. I should state clearly that I have no interest in this fishery, other than a desire to see it succeed further and to stay open. It is a gem, and the owner deserves much credit for maintaining a sporting fishery in the face of the usual commercial pressures. I have been fishing at Barnes Lakes on and off for (takes deep breath) 15 years or so, and although I fish at a lot of other places too I keep coming back, even though it means a round trip of 140 miles or so. The gravel car park can take 6-8 or so average sized cars. The lodge is carpeted (no muddy boots please) and contains three armchairs facing a panorama window overlooking one of the lakes. It also has two small dining tables with bench style seats, a log burning stove for those cold and damp days, and a kitchen with a gas stove, a fridge, a kettle and a microwave oven. John (Barnes, the owner) keeps the kitchen stocked with tea bags and instant coffee, but be sure to bring milk if you want it. Be careful of the comfy armchairs; I have fallen asleep in them more than once, and missed some good fishing. And be sure to check the returns book, as there are always more than a few clues in it. Outside there is a patio with tables and chairs for when the weather is good. Around the corner but still attached to the lodge is a clean and heated toilet; why would anyone accept anything less in the 21st century ? Barnes Lake is next to the lodge & car park. It is almost square but the topography of the bottom of the lake is like a ring doughnut, rising in the middle with deeps about 10 yards out from the banks. This lake has hedgerows on three sides, so whatever way the wind is blowing, you can usually get out of it. The hedges can sometimes interfere with a long cast, but in reality you rarely need to cast far to cover fish. Kingfisher Lake is triangular in shape. It seems to fish best in summer, with the shallows nearest to the lodge producing some large fish from May to September. It is fairly open, and on windy days it you need to pick your spot carefully. It is here that you can see a rare thing happening in late summer � the fish take adult damsel flies as they return to the water to oviposit. This is the only water where I have ever seen this happen and the fish take the adults with gusto. This lake also has a decent hatch of mayflies in early-mid June; see Trout Fisherman for April 2008 for a mayfly feature on this fishery. Water Rail Lake at one time was used as a growing-on lake and the boundaries became over grown. The boundaries have now been cut back, the lake fully stocked and it is fishing astonishingly well as you might imagine. There is a deep channel in the bottom of the lake about 10-15 yards out from the bank next to Kingfisher Lake (see aerial photo below), and this channel often contains some very good fish. John is proud of the fishery and particularly proud of the quality of his fish. Be buys fingerlings which he grows-on himself. He keeps the density low in the growing-on nets so that when they are stocked the fish have complete fins and tails which make them attractive to look at and enables them to give an incredibly good fight, more like reservoir trout than small stillwater trout. He feeds them floating pellets so that they get used to looking upwards for food, and it seems to work, the fish rise very freely. A few years ago I set myself a challenge of catching at least one fish �off the top� in every month of the year, just to see if I could do it. I came here in January and February as I could be reasonably sure of finding rising fish here, even when the lakes were fringed with ice. It is also rare to have to fish more than four feet down. My favourite flies for Barnes Lakes are Shipman�s Buzzer, Claret Hopper and �F� fly for the top, Sawyer�s PTN, Blakestone�s Buzzer, and my own Skinny Damsel Nymph for sub-surface. It's not a rule, but it is definitely "the done thing" to book a rod for the day. It's also quite a sensible thing to do, as this fishery is popular for corporate days and can be block booked. Call 01865 300343 to book a rod, and to ask what is hatching etc. 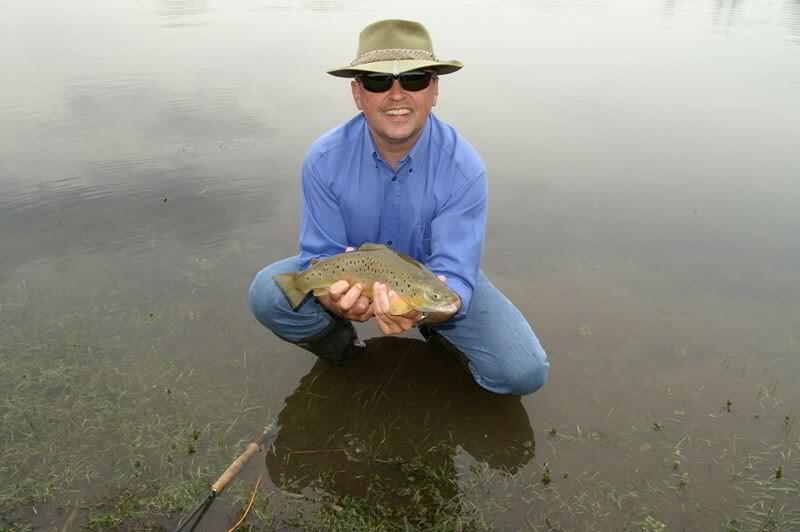 A day ticket allows you to catch ten fish and take two of them for the table if you wish. A half day ticket allows you to catch five fish and take one. At the time of writing a day ticket is �30, a half day is �20, and it has been that way for at least five years. The entrance to Barnes Lakes can be difficult to find as it is down what is little more than a dirt track. 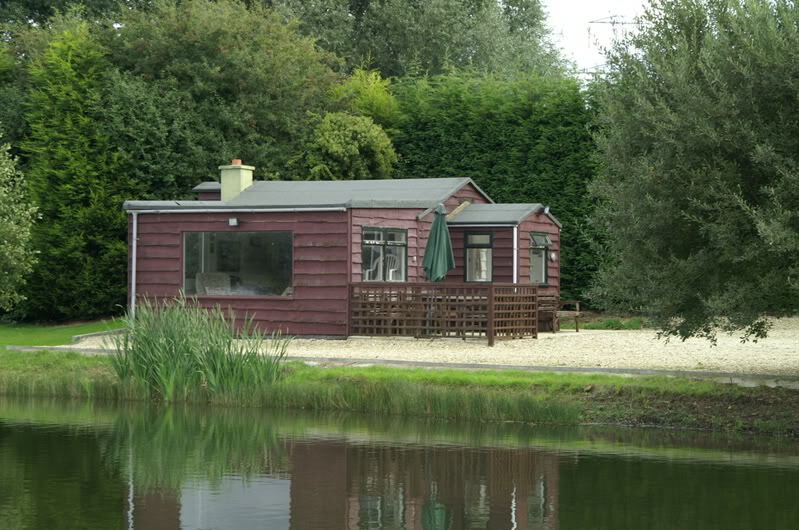 If you have a satnav, the fishery is at N51�43�02� and W1�25�30�. If you don't have a satnav, click here, Google Maps enter your own postcode and it will zap you right there and do the directions. I was there last night. There are not many anglers going there now (from the log book a few per month). The fish are in great condition and if you catch, you will be in for a fight and you will get a full tailed almost natural animal, they look like triploids but close to natural and healthy. Because the fish are behaving naturally, you will catch on good imitations at a time when they are feeding. I think it would be hard to catch on something fluorescent at a time when they are not. Last night a hatch of some kind of medium buzzer came around 9pm and the quiet lake became a riot of feeding rainbows. It is rare to find a place which takes proper care of the fish in our area, mostly they are over-stocked, of damaged fin and clueless of what natural food to feed on. It is a credit to the Barnes' that such a smallwater gem exists. Very happy with my half day ticket there. Is it still operating? I heard they were closing down. No-one in there since the start of May, then me last week. I think the owners are retired and not actively managing the fishery but they did have one lake stocked and it was magic. No-one in there since the start of May. That's a crying shame . Obviously needs a change in management. I heard they were retiring and no longer felt up to the general management of the fishery but were using up the last of the fish they had on site and once they were gone.......! 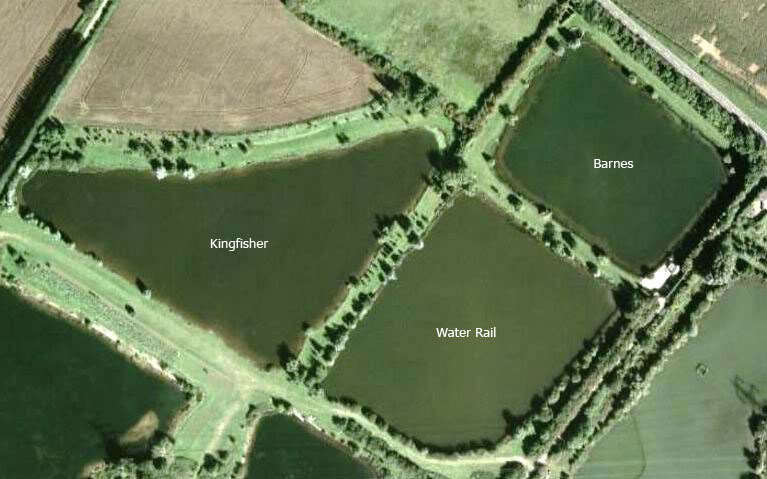 Could be an opportunity for someone to negotiate a lease as at least one of the lakes is an excellent tench fishery. I spoke to Janet Barnes recently - well, exchanged voice messages anyway - the trout fishery is now closed as John has been too unwell to continue with it. The whole fishery has now gone over to coarse fishing, anyone wishing to fish it should speak to Tommy on 07388 814090.